Project MANA could definitely not accomplish what we do without the overwhelming support of our friends, supporters, and volunteers. You can make a difference by donating funds, hosting a food drive or other event, and volunteering. 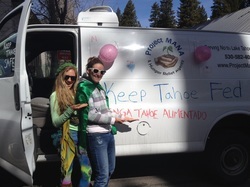 As a volunteer you will play an important role in our mission to reduce the incidence of hunger and promote nutrition through education and awareness throughout North Lake Tahoe and Truckee. Project MANA relies on support from the community to help collect food to support our mission. Learn about upcoming Project MANA events or host your own! Project MANA is pleased to work with partners throughout the North Tahoe, northern Nevada and northern California regions. Learn more about hunger in our community and beyond.